The lightweight design and versatility of Layher Allround® scaffolding has made a significant contribution to the ongoing maintenance at the Sullom Voe oil terminal in Shetland – a key BP facility. “The initial focus has been a 300 metre long jetty which supports a large amount of pipe work, used for loading crude oil from the processing facility,” he says. “Maintenance comprised blasting and painting, with the pipes also undergoing removal and replacement of insulation. 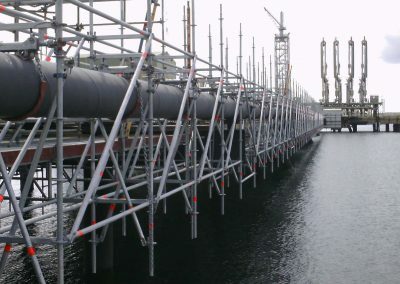 The scaffolding, therefore, had to provide good access to all the working faces around the jetty structure despite no ground support from which to build,” he adds. 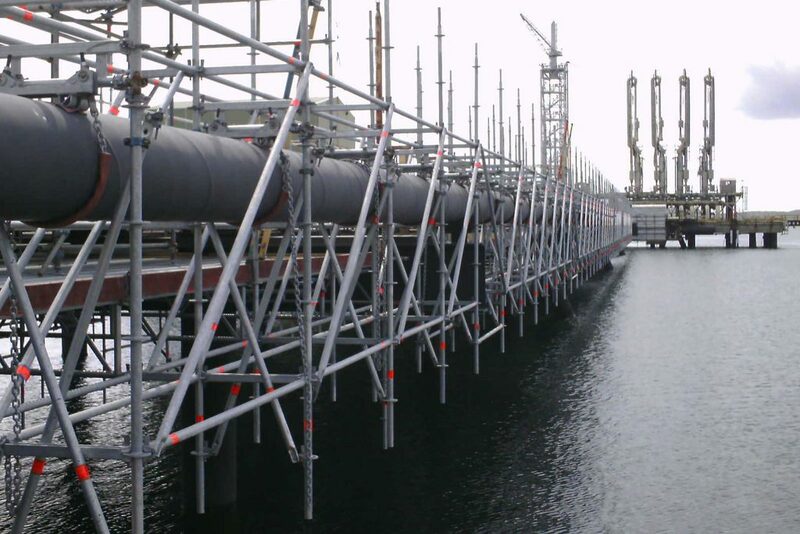 Standard Layher Allround® parts helped to create a hanging scaffold with the installation fitted throughout with Layher steel decking to provide a working platform with only minimal cross-bracing. The lightweight modular construction meant material requirements were kept to a minimum whilst installation speed was significantly improved –eight weeks rather than some 14 weeks with conventional tube and fitting equipment, points out Vince Bojlter.